Compression hosiery refers to the specialized designed hosiery products for healthcare and wellness. These products are used to limit the occurrence and progress of various venous disorders such as Thromboembolism. Moreover, these products also help the patient to get relieved of swelling in feet, ankles and legs. Compression hosiery is gaining popularity in various medical treatment process and therapies. Global compression hosiery market is anticipated to witness moderate growth of 5.3% over the forecast period. Further, the market is expected to account for USD 3,714.9 Million by the end of 2024 from USD 2,486.3 Million in 2016. Increasing cases of venous disorders is anticipated to spur the growth of the compression hosiery market during the forecast period. Moreover, availability of wide range of compression hosiery products is anticipated to supplement the growth of the compression hosiery market. In 2016, North America accounted for the highest percentage of market share in the regional platform and is expected to continue its dominance over the forecast period. Rising geriatric population is anticipated to impel the demand for compression hosiery in the North America region. 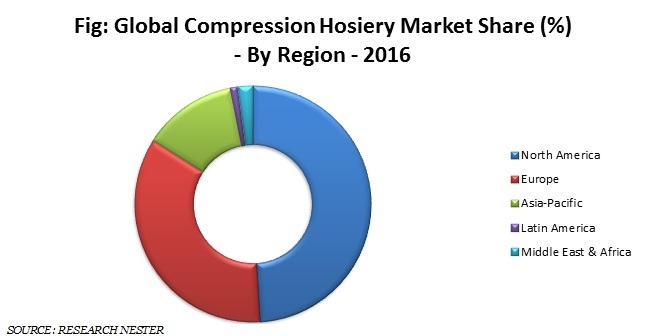 Further, increasing spending on healthcare is expected to positively impact the growth of the North America compression hosiery market during the forecast period. U.S. is witnessing augmented demand for compression hosiery in the North America region. Europe compression hosiery market is expected to grow at a substantial rate over the forecast period. Availability of customized compression stockings and garments is predicted to trigger the growth of compression hosiery market. Further, Europe compression hosiery market captured a market share of about 33% in 2016. Asia Pacific is projected to witness lucrative growth over the forecast period. This can be attributed to the strong growth of the healthcare industry in the region. Growing incidences of venous diseases is poised to drive the growth of global compression hosiery market. Moreover, increasing diabetic population across the globe is expected to impel the expansion of global compression hosiery during the forecast period. Additionally, growing popularity of compression therapy for the treatment of deep venous thrombosis is anticipated to foster the growth of the global compression hosiery market in the upcoming years. 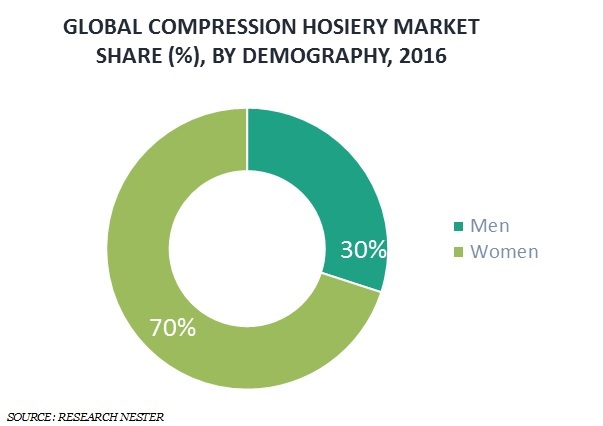 Apart from this, growing geriatric population across the globe is anticipated to supplement the growth of the global compression hosiery market. Further, growing adoption of compression socks and calves guard among athletes is anticipated to foster the growth of the global compression hosiery market. Further, innovations in compression hosiery products such as thin fiber & product improvisation to ensure patient comfort are expected to drive the growth of the market in the long run. Moreover, many compression garments manufacturers are providing custom fit hosieries. This factor is anticipated to foster the growth of the compression hosiery market during the forecast period. In contrast, high cost of compression hosiery is expected to hamper the growth of compression hosiery market. Further, lack of awareness about compression hosiery is expected to negatively impact the growth of the market.